4 new terrain boards for Mark, 12 feet of canal! Spent a terrific day in the company of Mr Freeth and Mr Waple playing a couple of games of Eastern Front CoC in preparation for Mark's forthcoming Barbarossa Big CoC weekends at the WHC later this year, although the first one is only a month away! I still have a few bits and bobs to finish before then (a bit more Soviet infantry and 4 x T26s) but all is in hand. One of the things we wanted for these games was a canal board - these will also do perfectly for planned France/Belgium/Holland 1940 games, not to mention Holland/Belgium 1944- Mr Waple is also keen to incorporate them into a Carentan scenario. They will also do fine for Mark's massive 20mm set-up. 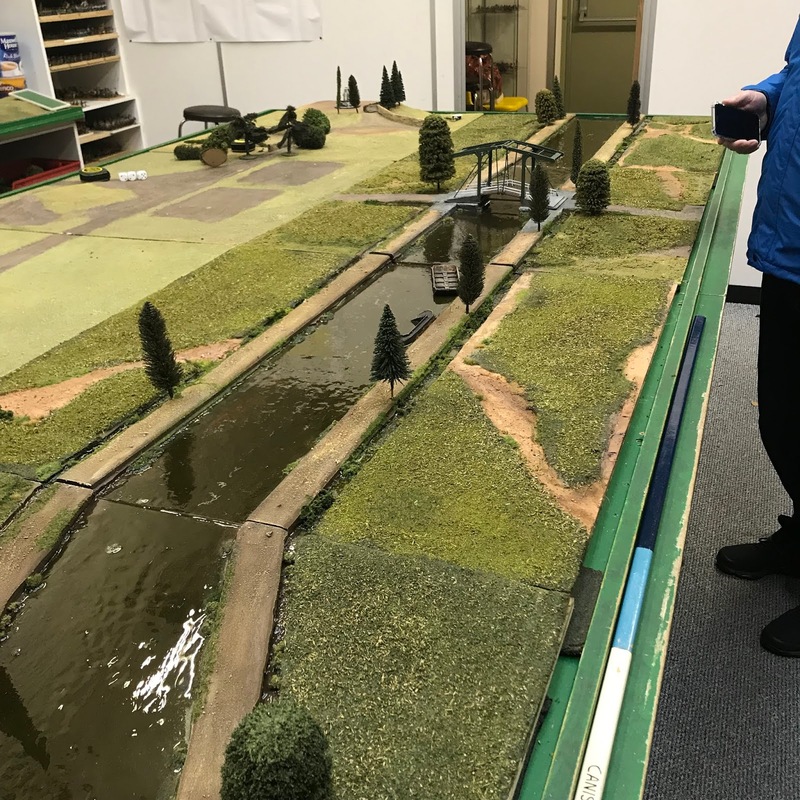 So, over Christmas I made 12' of canal...that's it really! They had to be on a 12mm ply base to match with the existing boards, so I routed out the channel and some ditches, then built up the towpaths with a further layer of 9mm MDF. The water was just painted brown and then resin poured- I'll have to do a further post really to give a bit more detail- suffice to say I have a little more fine tuning to do on them to match them to Mark's boards, but overall they have turned out ok. I'm well pleased. We laid out terrain for a normal CoC scenario, a straightforward 1941 game with a 4 section German platoon with 2 Senior Leaders and a 50mm mortar attacking over the canal against a big 4 section early war Soviet platoon, with their massive sections and a senior leader and an inferior SL + a 50mm mortar. It was an attack /defend scenario, with the Germans having a generous 12 support points and the Soviets 7. The Germans took a Stug III A (6 points), an Ig18 (4 points) and a preliminary barrage (2 points). The Russian picks (I think) were a BT5 (4 points) and 3 entrenchments (1 point each). 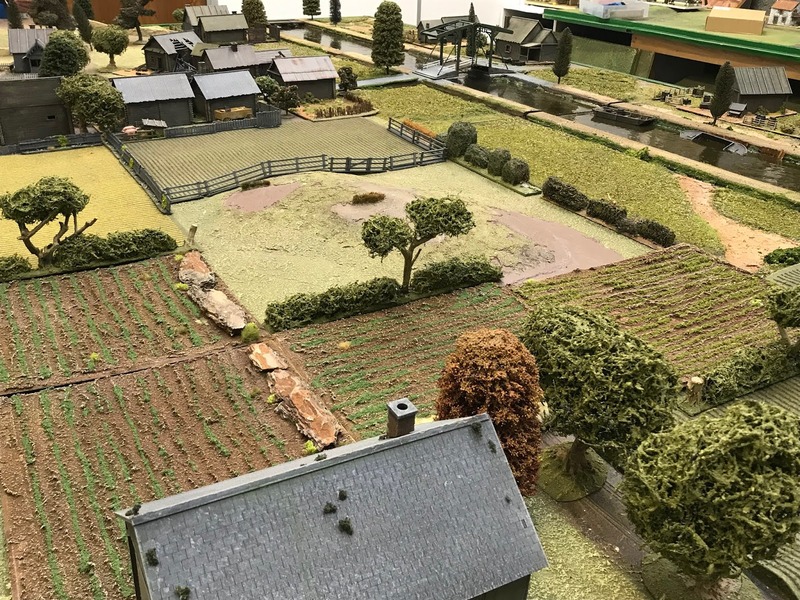 Given that the buildings, although numerous, were all flimsy wooden ones only giving light cover the trenches were a wise choice for the Russians. For the Germans, my logic was the Stug is a hefty beast, solid in all departments with both good defensive options and high offensive capability against both soft targets and any Soviet armour which might appear. The Ig18 gives another 75mm gun with which to hammer the Russians from range, this, in conjunction with the Stug should make it easy. The barrage was a nice bit of icing on the cake to hinder the Soviet deployment. So, onto the 1st game-FM was German 10 - Russians 9. The patrol phase was straightforward enough, The Germans only got a single free move which was disappointing, so we ended up with 2 fairly uniform straight lines across the centre of the table,. 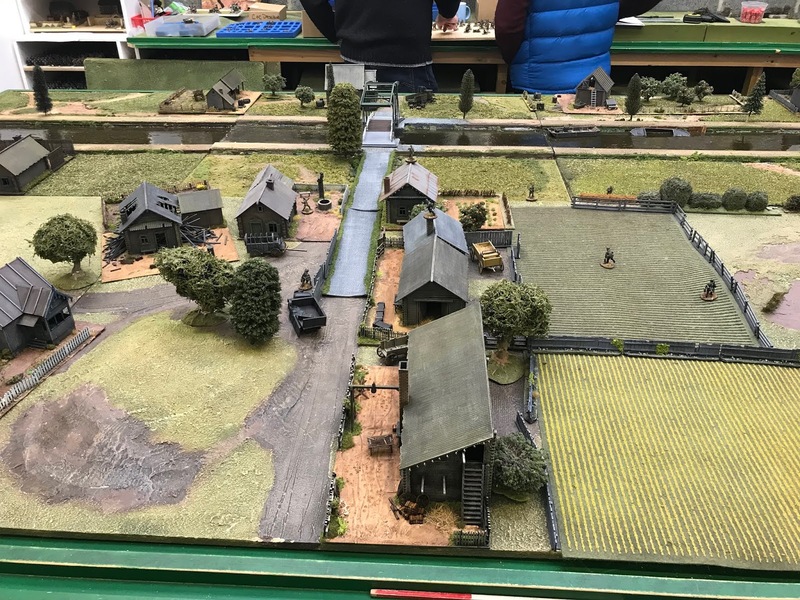 It meant the Germans got 3 Jump off points, 2 about 2' in, 1 to the right of the road, behind the barn 1 to the left of the road back behind the rise, and 1 way off to the right. 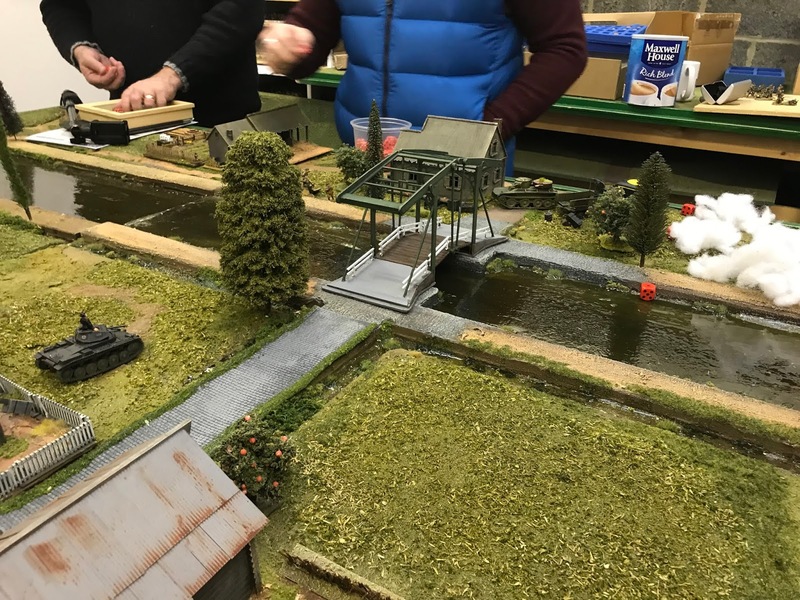 The Soviets dropped all 3 of theirs right back down to their baseline, spread out uniformly giving them access to the ditch and buildings on their side of the canal. So the German plan was simple enough, batter away with the Stug and the infantry gun from range, then strengthen with the infantry...Didn't quite work out like that. Both sides were a bit cagey, I got the Stug on early and pushed up the road, the Soviets did very little, and both sides accumulated CoC dice points, as the Stug drew level with the barn, I deployed an infantry section to advance tactically with it, and perhaps draw some fire. They did. 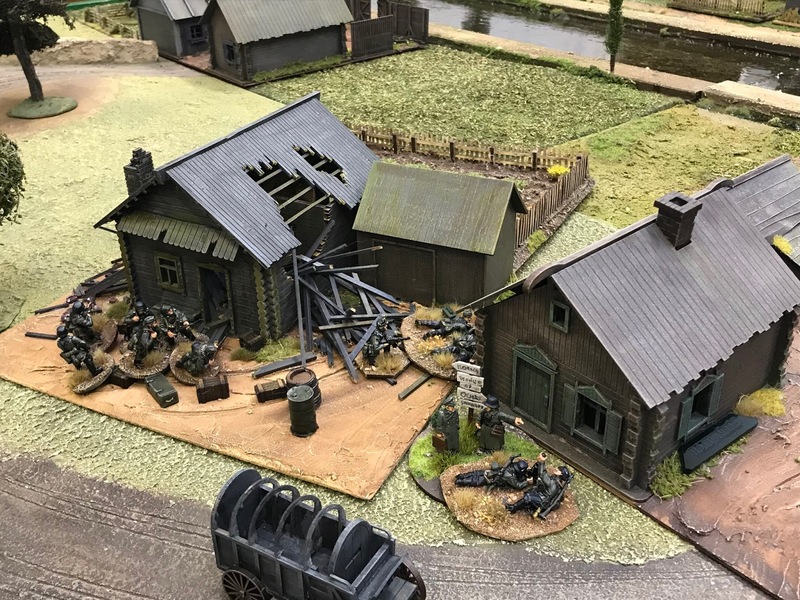 2 Soviet sections deployed in the house by the bridge and in the ditches and opened fire...despite being tactical the big Soviet squads were putting out a lot of fire (more than a German squad) 17 dice iirc, and the german section took a few hits which mounted up fast. There was very little room to deploy another section to put down covering fire, and although the Stug hit back with HE because it lacked an mg it couldn't cover the infantry. Then a BT5 hove into view on the other side of the bridge. The Stug had to redeploy in order to get the BT in its sights (no turret...grrrr). The Russian infantry could carry on firing unmolested. A brief duel took place between the armour, with eventually the Stug coming off best - the BT's main armament getting Ko'd. It scuttled off and reversed behind the house. Meantime the Soviets got a couple of double turns, and the German section took more hits, including the Junior leader! he took a round right between the eyes. The German FM took a hit, and the firepower of the Stug just wasn't proving enough to do major damage to the dug in Russians. Time for the Germans to up the ante, there now was room for the ig18 to come into play alongside the Stug, 2 x 75mm guns should do a bit more damage, they pounded away for a few phases, but it meant the concentrated fire of 2 sections now went against the little infantry gun...The Russians were simply rolling a lot more dice than the Germans, the casualties began to mount...the gun became pinned, then the JL commanding the gun was wounded- more FM loss, then he's hit again and killed- the gun breaks and the Russians sneakily end the turn with a judicious CoC dice. German FM at this point is 3....not great. A 75mm Ig18 gives additional fire support. What could go wrong? All models by Warlord, Painted by me! At this point I decided to call it. 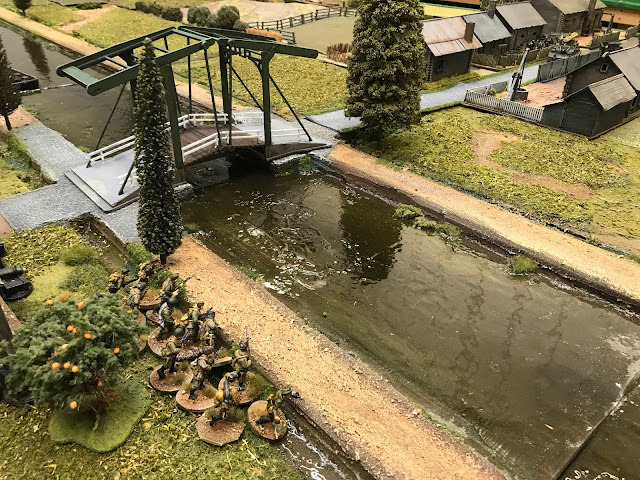 The Germans were not going to get over that bridge. 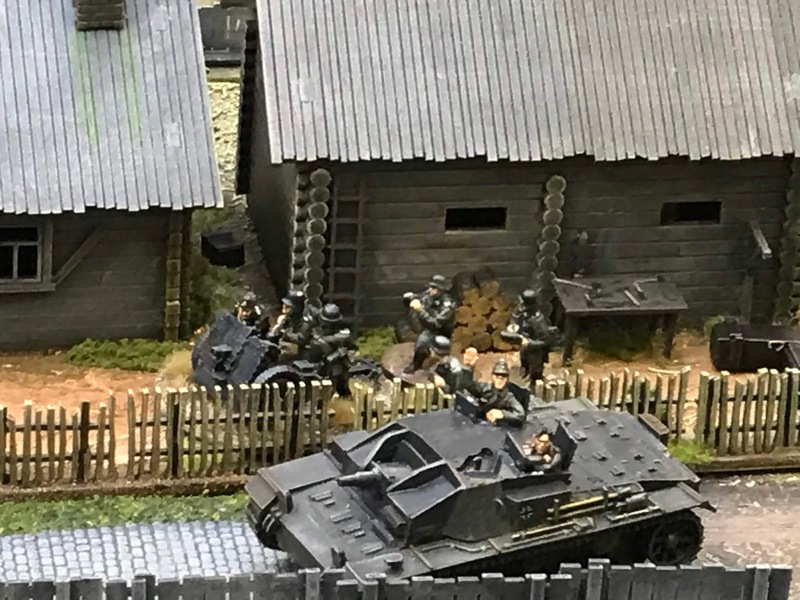 Yes, they could plink away with the Stug but it was frankly going to take an age for anything much to happen, and if I deployed any infantry to up the firepower, any BTH roll could be fatal. It was still early in the day and we could get another game in. 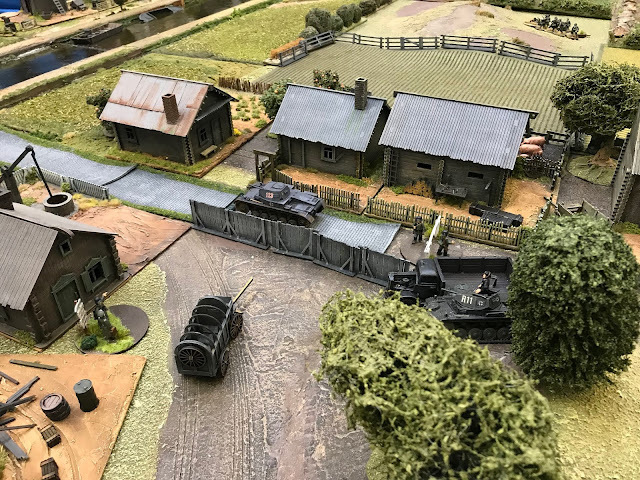 For speed, and rather than re-set terrain we decided to simply re-play the scenario, this time gifting the Germans an extra 2 support points, for a total of 14. And this is where it all got interesting. In many rule-sets simply replaying the same scenario with essentially the same forces would result in pretty much the same game, particularly in a scenario like an attack on clearly defined defence line. This is not what happened at all. FM rolls went German 11 Russian 9- In the patrol phase the Germans got 2 free moves, but it played out fairly similarly however, this time the Germans got a bit further forward, getting a JOP behind the bomb-damaged building on the left. For the Germans the support picks were very different.I took 2 x Pzr II's at 5 points each and an observer for a mortar battery. The Russians, it transpired swapped it about a bit - A BT (4) and an ATR (2) and a trench. No hanging about this time, I quickly got on both Pzr II's and they advanced up the road, leapfrogging with one on over-watch as the other advanced, I got a section way out on the right which advanced in the lee of a rise, heading for some hedges. 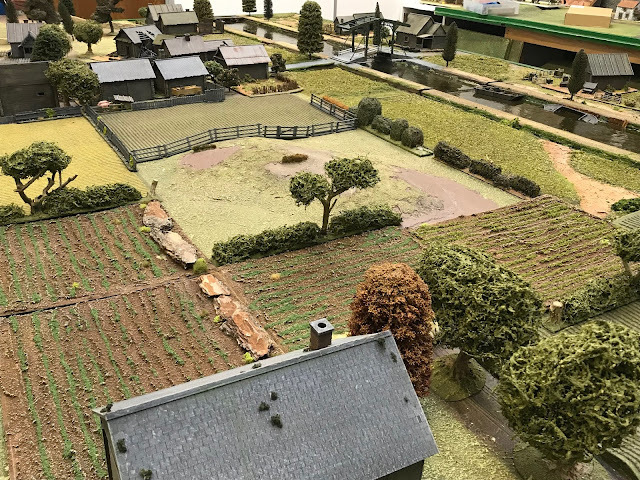 The FO got into the barn next to the road with a good view of the Russian left- any of them popping up to attack the German section there would get pounded by the 81mm battery. I quickly deployed a German section who could put fire down on the ATR, This combined with fire from the Pzr upset the ATR but couldn't get a decisive hit- the ATR fired again- this time disorientating the Pzr's gunner- no activation next phase- it was getting very tense- the BT kept firing at the other Panzer, and scores a winning hit- the Panzer is knocked out but the crew escape- things are looking bad for the Germans yet again. Finally, the Germans get some hits...a Soviet section has deployed along the river to fire on the Germans hitting the ATR, A firefight ensues, the Germans lose an entire LMG team, The ATR goes down in a hail of cannon fire from the stranded panzer, both FM's are starting to trickle down. The Russians have opened up on their left and are duly met with a brutal mortar barrage, the Russians end the turn, but hadn't realised the Germans held a dice to continue the barrage- The Russians play a second CoC dice and the turn ends but not before the barrage gets a a couple of lucky kills on the Russians. Infantry attempt to build a base of fire on the left flank. on the Russians, the ability of the Germans to use individual teams paying off in the face of the sledgehammer Russian sections. 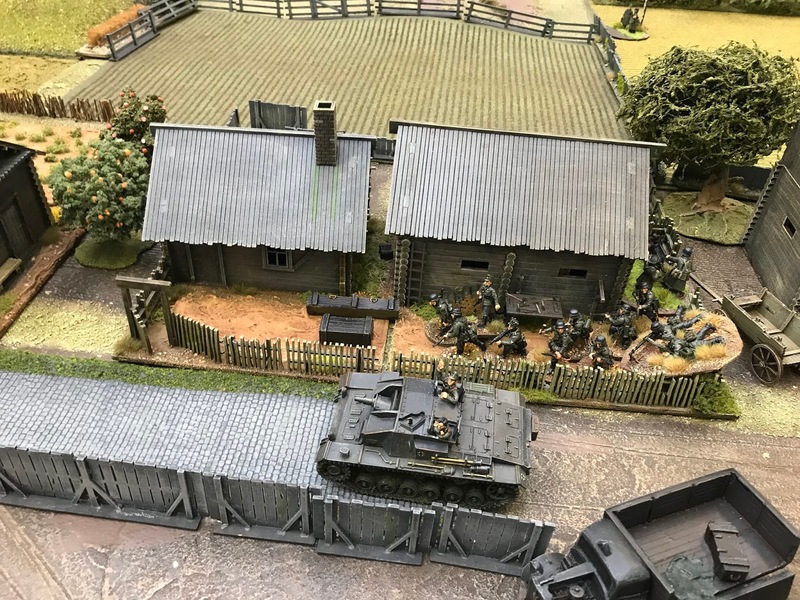 A couple of Soviet leaders get wounded, the little panzer pouring in cannon fire onto the infantry- finally with yet another Coc dice the BT advances, interrupts and fires on the PanzerII- it misses! The little German mortar keeps chipping in with the odd hit on the guys in the ditch. 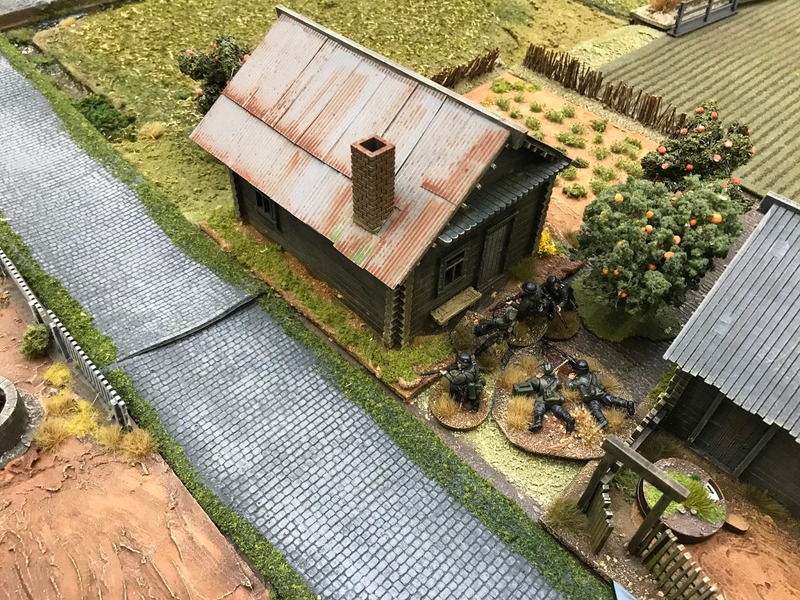 The Germans are winning the firefight. 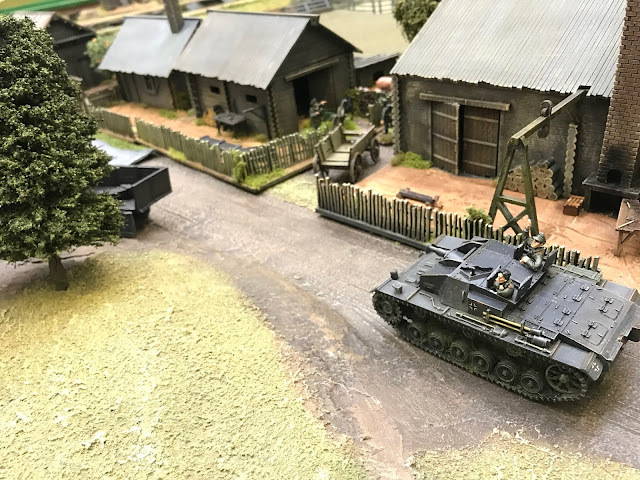 The lead Panzer II dukes it out with the BT5 over the canal while the mortar barrage pounds the Soviet infantry on the right. Bridge is a Sarissa kit. The Panzer now has a shot at the BT...gets 3 hits- zero saves from the Russians- BOOM! the Russian tank is burning, their FM plummeting. This leaves the panzer free to keep firing at the dwindling section to its front, The FO manages to call in the mortars for a second time which again start to hit the left flank Russians...A brutal lucky hit clobbers a couple more Russians including the JL. and the Russians break- BTH and the suddenly their FM is at zero.....the Germans have done it! Great fun, a fine time was had by all. BUT...what really got me thinking was how different the 2 games were. They were both exciting, they both had their moments of tension, but both sides employed similar forces and tactics for both games..yet they were totally different. It could have been the first game where the power of the Stug prevailed, it could have been that the German mortars had no effect, The BT might have one-shotted the second Panzer...there were a lot of possibilities, and it shows why CoC is such an intriguing game. Can't wait for the Barborrossa big CoC campaign week-end where the canal will double up as the Kharkov river at some point. In my crystal ball I foresee T34's...and a Soviet counter-attack!